The most popular route for rides at Grand Canyon is the Hermit Road or Yellow Route which takes visitors from the the Park rental facility, through the village and up to a road which is closed to public traffic. The Hermit road offers the best river and rapid views and is a combination of paved road and greenway riding. It does have a one mile stretch of incline so you should be in shape for this ride. 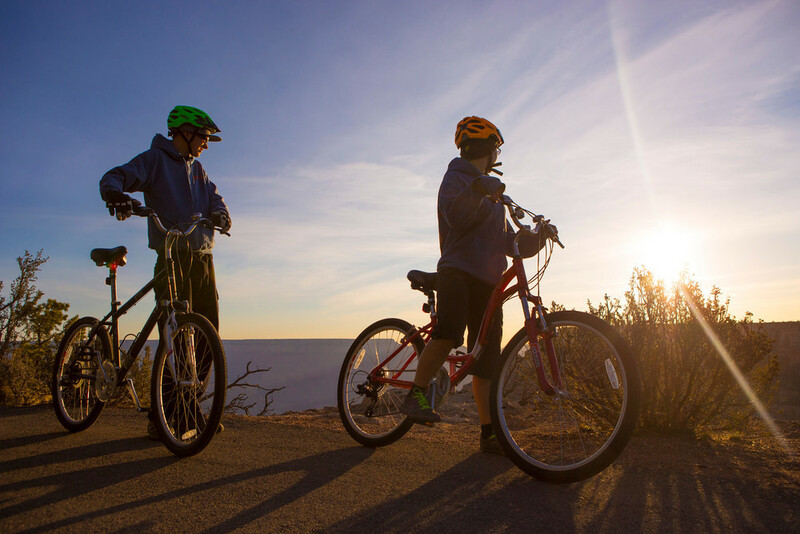 For a shorter version of this route that bypasses the hills and town navigating and is ideal for families or those with less time, try Bright Angel Bikes "Red Route" where you use a shuttle to drop you off at Hopi Point. The Yaki trail which departs directly from the visitor center offers a 7 miles round-trip bike ride that weaves close to the rim and guarantees spectacular views in a short amount of time. See Bright Angel Bicycle's map to get a better picture of the different routes you can choose. 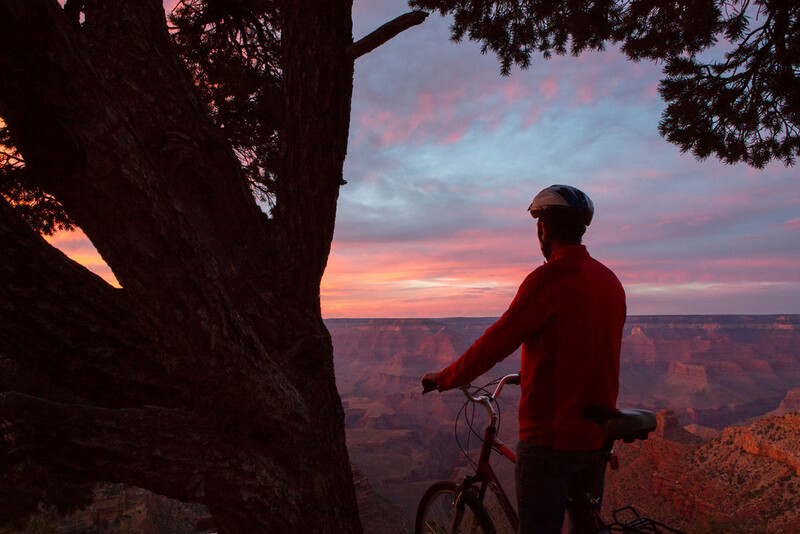 Grand Canyon offers unparalleled opportunities for road and cruiser biking. The Park has 15+ miles of paved bike paths along the rim and an additional 20+ miles of paved rideable road routes. The Hermit Road is closed to public traffic in summer and allows bicyclists to enjoy the Park's best river views and deepest vista's without competing with cars and massive crowds. The route you choose at Grand Canyon for road biking depends on how much vehicle traffic you want to incur. The two routes recommended are either a) the Hermit Road which is a shorter ride but avoids vehicle traffic and heavy crowds or b) the desert watch view road which you'll share with cars and buses. The desert view road has less in the way of hills, but more in the way of distance. Road bikes are available for rent as well. If you read the tripadvisor.com reviews of riding Grand Canyon with kids, it's a win win win win kind of situation. Most report the routes easy and fun enough for children to navigate. The rental facility offers kids bikes for those old enough to ride, trailers for babies and toddlers, and tag-along bikes for those in-between. Make to pack plenty of water and snacks though, as kids get dehydrated fast! Grand Canyon weather is fickle at best. You are as likely to encounter a sunny 50 degree day in January as a blizzard and temps below freezing. The good news is that none of these scenarios prevent you from riding the rim. Grand Canyon is pioneering winter biking in the Parks by keeping the trails maintained in winter months and offering fat bike rentals and tours at their facility. This is truly a unique experience and we highly recommend bundling up and trying it! More info here. Mountain biking is not currently permitted into Grand Canyon on the South Rim. There are however nearby forest service roads outside the park gates where you do some great rides. There are however great rides on the North Rim of Grand Canyon. There are several websites available to see peoples reaction, input and advice on biking at the Grand Canyon. Tripadvisor.com reviews are here, Yelp reviews are here, and the Lonely Planet overview is here. We'd love to also hear from all of you about your experience riding at Grand Canyon. Write your review and submit your photos and videos here.